Waxing has been around for many years and has become one of the most affordable ways to get rid of unwanted hairs without the need of an ugly harsh razor blade that causes itchiness and the next day will be there again. People from 15-85 years of age are waxing, man and women. It has become a part of our hygiene. It makes people feel clean, younger and sexier. Is your hair long enough to be waxed? Check if the length of the hair is more then ¼” long, or that it has been 4 weeks from your last waxing or 3 weeks from your last shave. If the client has many in-growns we do advice to do a soft scrub 24 hours before. It helps remove dead cells and some scabs caused by the in-growns. By removing the scabs the hair will be on the surface and the wax will stick to them and removed. People sometimes ask if we should take anything before coming in. The client can take a Tylenol 30-45mins before coming in. It can help with some swelling and pain. Also, by avoiding alcohol or coffee your skin won’t be as sensitive. After the service is complete we suggest that the client pre-books. The purpose of this is to help the client not feel tempted to shave. Shaving in between sessions will cause the hair to grow thicker and stronger; leading to a painful and sometimes complicated next wax session. The waxing sessions depending on each person can vary from 4-6 weeks. 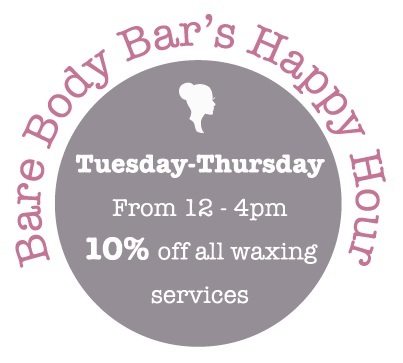 Avoid hot water, saunas, and exercising 24 hours after the waxing. For first time clients that have never waxed or usually shave the Brazilian area, it is normal to feel sore for 24-48 hours after the wax. Clients that do their bikini, deep bikini or Brazilian on a regular basis can also see some redness. If the client`s hair is very coarse it might bleed a little during the wax and cause irritation for the next 2-3 days. When your skin goes through waxing or even laser hair removal the best thing to do is just let the skin breathe. No creams are necessary if all the symptoms are normal. We advise to put on some loose clothing especially if the client has done a full Brazilian wax.